In the construction of the wall is generally from the sheet piles positive and negative locking stitching. According to the size of the wall to determine the use of Larsen sheet piles length. Shun force of steel before to introduce some common construction problems, such as the construction of sheet piles leakage phenomenon, the solution of sheet piles diagonal measurement and how to deal with these issues, emergency and preventive measures. 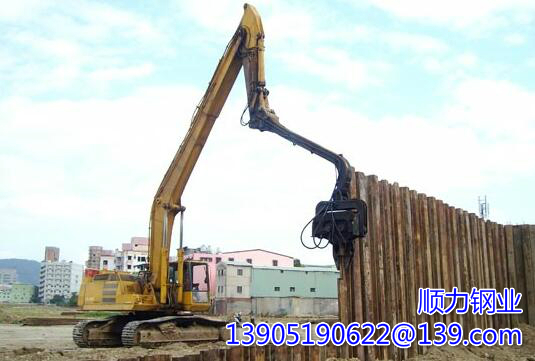 Today, the steel industry to give you the introduction of sheet piles construction of the company with the problem. sheet piles co-connected problem form: the back into the sheet piles and the adjacent pile has been driven down. sheet piles co-connection problem The main reason: the construction of the sheet piles by the vertical gradient incline is too large leading to the adjacent slot resistance is too large, so as to promote the adjacent sheet piles sinking. 2, the use of temporary fixed-angle welded steel piles to lay the other. We should be in the actual construction process as soon as possible to prevent this phenomenon of sheet piles co-connected to the construction of a good grasp of each operation and review the safety aspects to avoid delays in the construction delay.